Stefan Skirtz and Andrew Johnston met at the nationally acclaimed Midwest Culinary Institute (MCI) just a few years ago and have maintained their relationship since then. Andrew started at MCI right out of high school while Stefan transitioned into pastries after working professionally for many years elsewhere. "We were the only two guys in a program with 30 to 40 other women," explained Andrew who went on to say that the pair wanted to bring a "masculine touch" to the pastry/bakery business and food world with Skirtz & Johnston Fine Pastries and Chocolates. Something else the two wanted to bring to Cincinnati was an old world bakery that focuses on fresh products made daily with local ingredients by expert pastry chefs and bakers. "We're really old school in the way we work, and the bakeries in town that operate in that fashion are at capacity," said Stefan. 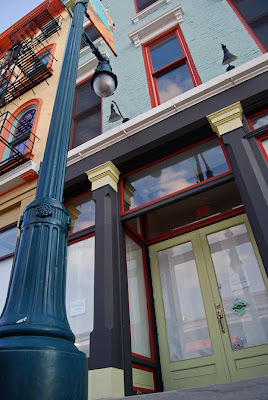 "We found a great location and love Findlay Market, the people, and the other vendors." The new shop at historic Findlay Market will offer pastries, chocolates, bread, high-end cakes, sandwiches and other items all made fresh and from scratch in the old world fashion the two pastery chefs live by. The co-owners also see the new shop as a perfect fit for Findlay Market which has been in need of additional freshly baked bread. Once open on the south side of the Market House, Skirtz & Johnston Fine Pastries and Chocolates will have two parts to their shop. The western part of the double store front will serve as the pastry shop where all the bakery operations will occur, while the eastern portion will initially serve as a bistro and gallery space for community gatherings until the owners are able to expand operations and create a confection and cake shop there. "The possibility for future expansion made the space really desirable," said Andrew. "But for the mean time the eastern portion will work well for meeting and lunch opportunities during the week and events during non-typical shop hours." The MCI pastry chef duo also plan on staying true to their pastry roots by working closely with pastry co-op students from the MCI program. 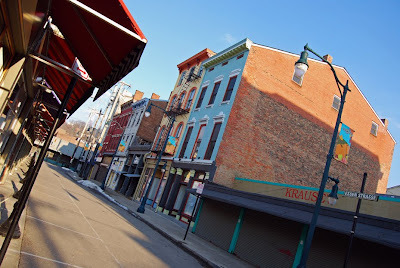 The future Skirtz & Johnston bakery sits quietly next to Kause's on the south side of the Markethouse on a closed Monday afternoon at Findlay Market - photography by Jeremy Mosher. "We wanted to create an opportunity to further our craft and future employment opportunities for Midwest Culinary Institute students where they can work with bread, cakes and everything else we do," Andrew explained. "Some of our main goals include education and advocacy in addition to furthering our craft." As a result when you come in to the bakery Stefan says that you can expect to see bakers and pastry chefs at work in a "flour on the floor" style bakeshop, and that when you walk in you will see all the way to the back of the shop where the mixers are. "We want people to see the craft taking place and we want to engage our customers," said Andrew who also detailed the shops local approach by purchasing everything from local suppliers including a partnership with fellow Findlay Market vendor Churchill's. Andrew and Stefan are looking to be open in some fashion in time for the Opening Day Parade on April 5th with a grand opening sometime after that. Once open full-time, the shop will open at 8 or 9am on weekdays, 6am on weekends, and stay open throughout the day offering lunch in addition to their bake goods. Interesting, I can't wait to see what a "masculine touch" is. Can't have too many bakeries can we? Excellent news for Findlay Mkt. and Cincinnati! I suspect this sort of news will continue to become more frequent the closer we come to installing a streetcar in the city. I'm rolling my eyes about the "masculine touch" comment but can't wait for more bread and pastry options in the basin. What's wrong with them wanting to bring a masculine touch to the bakery business? My great grandfather was a baker, and my grandfather grew up at his knee in the bakery. Nothing is manlier than a great baker. Randy, I just don't think that baking is as much "woman's work" as they've suggested based on their experience in the classroom. The "masculine touch" seems like an unneeded comment -- I think we're all just eager for another, different and tasty option. That's good enough! it looks as though the "masculine touch" was a direct quote. if the guys said it, it's what they think. whether it's dudes or ladies, I for one am super excited for another great bakery option at Findlay Market!! You are correct Jenny. Stefan and Andrew described their experience from MCI to me, and then went on to say how that experience has influenced them professionally and in this endeavor. I was simply trying to relay their story to the readers. Yup, that's why I called it "the 'masculine touch' comment" -- in reference to the quote, in other words, their comment. Well, we'll just have to see if these boys can handle a woman's work, won't we? I think you're reading too far into the comment Maya.